Bryon discovered a passion for working with molten glass while studying fine arts at California State University in Chico, where he was first introduced to the medium. 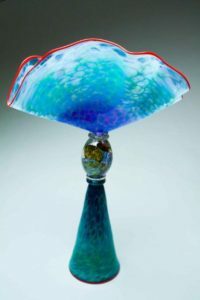 After earning a Bachelor’s degree in Fine Arts with an emphasis in Glass Sculpture, he worked and developed his skills at “Orient and Flume”, one of the pioneering glassblowing studios in the United States since 1972. He then studied in New York at the renowned Corning Museum of Glass with Bill Gudenrath, master Venetian glass artist, for whom he later worked, by invitation, as his teaching assistant before opening his own studio in Northern California.